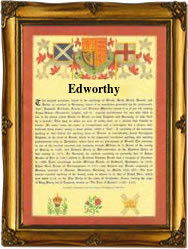 This interesting surname of English origin with variant spellings Edworthy, Edworthye, Edworthie, etc. is a locational name from Edworth in Bedfordshire deriving from the Old English pre 7th Century personal name "Edda" plus "worth", "enclosure". The placename is recorded as Edeuuorde in the Domesday Book of 1086, and as Eddewrthe in the Feet of Fines of 1198. The surname dates back to the early 13th Century, (see below). Church recordings include one William Edworthy who married Agnes Smart on April 2nd 1619, in Stockleigh pomeroy, Devon, and Ann Edworthye married Francis Wilson on June 3rd 1639, at St. David's, Exeter, Devon. Thomas Edworthy married Sarah Goodwin on January 26th 1848, at St. Leonard's, Shoreditch, London, and Louisa Saura Ann, daughter of Thomas and Elizabeth Edworthy, was christened on October 8th 1871, at Holy Trinity, Paddington, London. The first recorded spelling of the family name is shown to be that of Peter de Egeworth, which was dated 1221, in the "Assize Court Rolls", Gloucestershire, during the reign of King Henry 111, known as "The Frenchman", 1216 - 1272. Surnames became necessary when governments introduced personal taxation. In England this was known as Poll Tax. Throughout the centuries, surnames in every country have continued to "develop" often leading to astonishing variants of the original spelling.